Where does the original paella recipe come from? Why the name of Paella? How to prepare the true paella? What are the essential ingredients in a vegetable Spanish paella? What are the essential ingredients in a seafood Spanish paella? 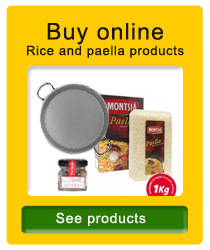 What are the essential ingredients in a mixed Spanish paella? 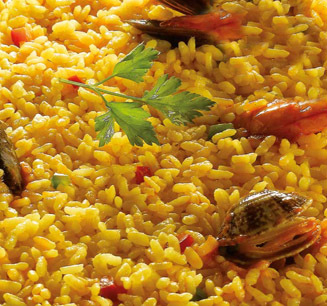 The paella, as dish, has its own story, with a great link with the usage of the rice in the Mediterranean area. 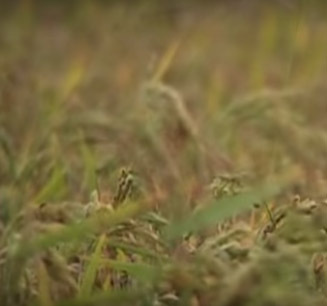 The rice, coming from Asia, was settle in Europe in 330 B.C., when the first roads and trade routes were opened. El arroz, procedente de Asia, se instaló en Europa en el año 330 a.C., cuando se abrieron las primeras vías de comunicación y rutas comerciales. However, the rice was not cultivated in Spain in large amounts until the arrival of the Arabs. Not until 1324 that the first reference does appear in a stew with rice in the Book of Sent Sovi, a recipe for rice and almond milk. Perhaps during these early times,the ability of the rice to restrain flavors made people elaborate rice recipes cooked in a broth with giblets. In the sixteenth century it is reported the cultivation of rice in Valencia by Francisco de Paula Martí, who wrote a short treatise in which he shows how famous was the paella dish "with anything they cook: meat, fish or just vegetables". The first documented reference of the paella appears in a manuscript of the eighteenth century recipes where specific aspects of its preparation and distinguish, for example, how dry it should be, and distinguishes between the "rice Catalan" or “rice Valencian". The popularity of the dish is very high in the Spanish territory since the late eighteenth century. Also, it became very popular in Belgium where it is called Riz a la Valenciennes and then the dish became popular all around Brussels. The ‘paellización’ of Valencian gastronomy comes at a time between the eighteenth and nineteenth century due to the dramatic increase in the production of the grass and it will be from the creation of the provinces (mid XIX) in Alicante gives a qualitative leap. In the twentieth century, the tourist boom in Spain in the 60s makes tourists from other countries arrived to enjoy the sun on their vacation, try the plate and create a demand that extends throughout the country, including non-coastal areas as is the case of Madrid. And little by little, the culinary recipe was expanding throughout the world. 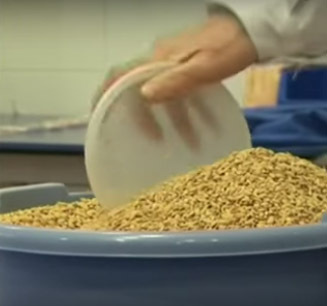 The Ministry of Agriculture of the Valencian government with the Regulatory Council have developed the Designation of Origin rice from Valencia, a record of any paella ingredients under the name of Paella Valenciana must take if it is to be marketed. Basic ingredients of the valencian paella that are always used: chicken, rabbit, ferraura (green beans), broad beans, tomatoes, rice, olive oil, water, saffron and salt. And by region, ingredients such as garlic, artichoke, duck, paprika, rosemary or even snails, also accepted variants within the denomination of real "paella" allowed. 4. Where does the original paella recipe come from? As recipe, this is a dish of humble origin born in the Albufera of Valencia, specifically, according to the oral tradition of the area, in the town of Sueca. Thanks to the popularity of this dish, at present, it has been expanded with many variations in ingredients adapted to different regions of Spanish cuisine. The paella has become an icon of Spanish gastronomy. 5. Why the name of Paella? Although in all the coastal communities of the Albufera (birthplace of the dish) the recipient is called "pot" and "ferros" to the bracket, the word ‘paella’ in Valencian language means pan and was the recipient which lent its name to the mentioned plate. The paella pan or ‘paellera’ is usually made of iron or steel, wide, with two or more small handles, shallow depth and large area. It should always has large diameter and should be very shallow. Its flat design and shallow favors rapid evaporation and uniform of the broth, essential feature for the correct preparation of the paella. Their depth is usually not more than about five or six centimeters and its diameter varies depending on the needs. They can be found between 10 and 90 cm in diameter. Pan without the tipical handle, in whose place you have it set two handles, one on each side, to help reinforce it. The first time a paellera is acquired, should be well washed to avoid the metallic taste. 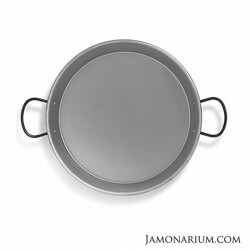 In Spain it is easy to acquire one of these vessels, which are usually marketed in two types: with steel or nonstick sight, there are also aluminum paelleras. 7. How to prepare the true paella? Rice is the main protagonist of the paella. The cooked grain absorbs flavors and aromas of all its ingredients. The over-cooked rice loses the ability to retain flavors and aromas. When selecting a rice for paella, there are two key features to consider: the first is the ability to absorb water and the second resistance to open during cooking. Medium-sized rice are the most commonly used in paellas, about five millimeters. The endosperm starch structures are responsible for "store" the flavors. The quality of rice is due to its composition, the pump is preferred because it is the best kept the two properties mentioned, absorbs water without being mushy after cooking and not easily broken. The average cooking is between 15 and 20 minutes. The approximate amount of rice is about eighty or one hundred grams per diner, or a generous handful. 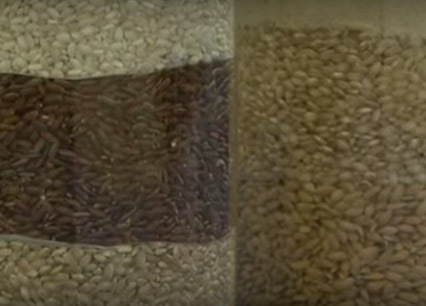 The proportion of water for cooking depends on the type of rice, but in most cases is usually between two and half times (to three times) the volume of rice used. Usually it left after boiling the past 5 minutes almost without fire. 8. What are the essential ingredients in a vegetable Spanish paella? To make a sauté sauce, tomato is essential. Fry the meat in olive oil. Once the meat is fried, add green beans and artichokes. It is very typical also add red pepper strips. Subsequently the tomato. Meat, usually chicken, rabbit or, less commonly, wild duck meat. 9. What are the essential ingredients in a seafood Spanish paella? The most popular variant is the seafood paella that dispenses mostly vegetables and substitutes meat by various shellfish, molluscs and fish, besides replacing water for fish broth, but not compulsory. The ingredients for the paella are, apart from the previously mentioned essential, cuttlefish, squid, prawns, lobster, clams, mussels or clóchina. 10. What are the essential ingredients in a mixed Spanish paella? Another variant of the traditional paella is the paella mix, mixing the meat (chicken and rabbit) with seafood paella. Some include ingredients such as peas, onion, sausage, mushrooms and chorizo. In some areas you can find even paella with snails. 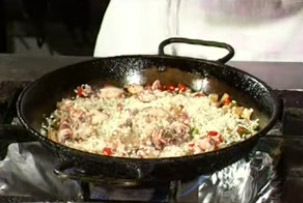 The paella was a dish that brings people together to celebrate an event. This is a fundamentally festive dish. Due to its laborious preparation and its ingredients were a luxury for most people for a long time when you had to make any celebration dish paella was chosen. The day of the week, Sunday, allowing the family to get together and celebrate, whatever the reason is. Often with changes that deviate from the original recipe, the paella has become a dish widely consumed throughout the Spanish territory. 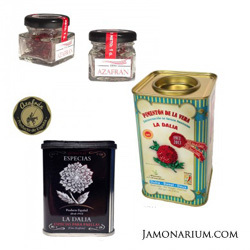 It can be found in every Spanish tourist sites, and it is rare not to find it in the daily menu of most restaurants, sometimes served as tapas in bars. Always it holds a main position when it comes to talk about rice dishes. It is taken internationally as a dish of Spanish cuisine and by extension of the Mediterranean. In its evolution has been given new recipes. Associations of hoteliers, chefs and restaurateurs have criticized this fact and have called for an appellation of origin to the traditional paella recipe in order to avoid people using the name for recipes that have little or nothing to do with the typical way of preparing the dish.